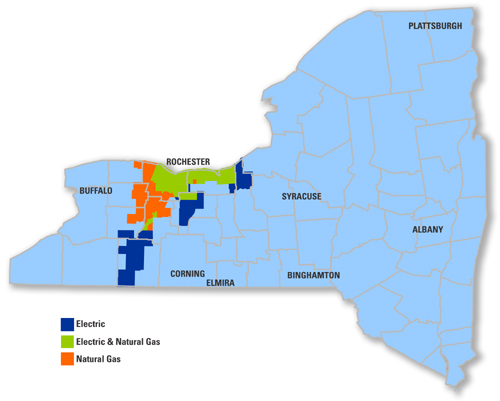 Rochester Gas & Electric is an electricity & gas utility company in New York State based in Rochester, NY. For customer service: 800-743-2110 (7:00 AM - 7:00 PM (Mon - Fri)). For emergency service (800) 743-1701 (24/7). Payment by credit card over the phone on (877) 266-3492 is possible between 7am-7pm (Mon-Fri). For you to understand your RG&E bill, we have created page of detailed explanation of each part of your bill: Understanding your Bill. For more information about rates and tariffs with RG&E, please click here: Rates & Tariffs. For historical values of electricity supply prices. You will find here 2014 values for the price of the electricity supply. The RG&E electricity supply prices are divided per region, so we have showed average prices over the whole territory and prices which are specific to each territory. You will find which territory you are with a table listing the cities in each territory. Budget Billing is a method for the customers to spread out their bill equally over the year, in order to avoid irregular monthly bills, mostly caused by market and seasonal variations. To sign up, and for additional information, please visit our RG&E Budget Billing page. RG&E covers an area of about 2,700 square miles (6% of upstate New York), and serves a primarily urban area composed of 1 large city and 80 towns and villages.